Triamterene/hydrochlorothiazide is known as a special drug combination which is known as diuretic or water pill. This is a combination of thiazide diuretic (hydrochlorothiazide) and potassium-sparing diuretic (triamterene). This combined medication works by making the elimination of sodium from kidney and water from your body as a result it can easily lower the blood pressure of your body. On the other hand the triamterene component always helps to minimize the loss of potassium. What are the molecular formula, class and weight of triamterene/hydrochlorothiazide? Triamterene belongs to the class of organic compounds known as pteridines and derivatives. These are polycyclic aromatic compounds containing a pteridine moiety, which consists of a pyrimidine fused to a pyrazine ring to form pyrimido(4,5-b)pyrazine. hydrochlorothiazide belongs to the class of organic compounds known as 1,2,4-benzothiadiazine-1,1-dioxides. These are aromatic heterocyclic compounds containing a 1,2,4-benzothiadiazine ring system with two S=O bonds at the 1-position. Triamterene/hydrochlorothiazide is a special class of drug which is known as a diuretic or known as the water pill. This is a useful medication which especially uses for the treatment of high blood pressure and edema. How triamterene/hydrochlorothiazide works in the body? You can use triamterene and hydrochlorothiazide combinations medication alone or with some other medicines and this combined medication always use for the treatment of water retention (edema) or hypertension also known as high blood pressure. If you have high blood pressure then it can be very dangerous for your health if you don’t take any medication for this problem as per your doctor’s prescription. High blood pressure always put extra work load of the arteries and heart and if it continue for long term then your heart and arteries may not function properly as a result it can damage your blood vessels of the brain, kidney and heart. If this happened then there is always a risk of heart attack or kidney failure. If you can control your blood pressure then you are safer. Both triamterence and hydrochlorothiazide are diuretic medicines or you can say water pills. The main work of this combined medication is to reduce the amount of water in the body by increasing the flow of urine which always helps to lower your blood pressure. The triamterene always helps to keep maintain the potassium level of your body rather absorbing too much salt. Always take this medication as per your doctor’s prescription. Triamterene/hydrochlorothiazide is well available in two brand names like Dyazide, Maxzide. This medication is well available in two forms like tablets and capsules. All of these medications work same and you will find the same active ingredients triamterene and hydrochlorothiazide in these drugs but the only difference is the name and sometimes price so don’t confused always follow your doctor’s prescription. All these medications are good for edema and high blood pressure. What is triamterene/hydrochlorothiazide used for? Triamterene/hydrochlorothiazide medication can use alone or with other medications to treat hypertension. High blood pressure always puts extra pressure on the heart and if it continuous for the long term then it can damage the blood vessels of kidney, heart, brain and can also increase the risk of heart failure or stroke. Triamterene/hydrochlorothiazide is also prescribed to treat edema. Triamterene is a special type of water pill or diuretic which always helps to prevent your body from losing too much potassium. This combined medication always helps to reduce the amount of water in the body in your body and increasing the flow of urine which always help to reduce the high blood pressure. Triamterene/hydrochlorothiazide medication is well available in two dosage forms like capsule and tablet. When the thing comes to strengths of this medication it is well available of three strengths like 50mg-75 mg, 25mg-37.5mg and25mg-50mg. Never take medication according to your own choice because it can cause serious damage to your health. As always, you need to remember one thing always that always takes medicines as per your prescription. Never take any extra dose or fewer doses because it can cause serious health problems for you. Here you can get some dose information regarding triamterene/hydrochlorothiazide dose for various indications. So let’s start. The usual adult dose for edema is 25 to 50 mg of hydrochlorothiazide and 37.5 to 100 mg of triamterene orally single time per day. If the patient becomes hypokalemic on 50 mg of hydrochlorothiazide then you may be transferred directly to the hydrochlorothiazide 50 mg-triamterene 75 mg orally per day. Patient who become hypokalemic on 25 mg of hydrochlorothiazide then you have to transferred the dose directly to 25mg hydrochlorothiazide and 37.5mg triamterene orally once per day. Patients in whom hypokalemia can’t be risked may be started with the dose 25 mg of hydrochlorothiazide and 37.5 mg of triamterene orally once per day. The normal adult dose for hypertension patient is hydrochlorothiazide 25 to 50 mg-triamterene 37.5 to 100mg once per day orally. If the patient becomes hypokalemic on 50 mg of hydrochlorothiazide then you may be transferred directly to the hydrochlorothiazide 50 mg-triamterene 75 mg orally per day. This is contraindicated in case of patients with acute, anuria and chronic renal insufficiency or significant renal impairment. If you have liver problem then you need to use this medication quite cautiously. Never use it as per your own decision always take advice from your physcian and use the medication as per the prescription for the better result. 75 mg of hydrochlorothiazide and 100mg of triamterene combination is known as the highest dose of this medication. But for the highest dose, you need to check up your body and should ask your doctor. Never take any excess dose because it may cause a serious health issue. So always take medication according to the prescription if you sill mark side effects then immediately check up your body because you may need the dose adjustment. If you are taking triamterene/ hydrochlorothiazide and you may mark some side effects then never neglect to any side effects, immediately go for the treatment. Sometimes you may need dose adjustment for the better result. 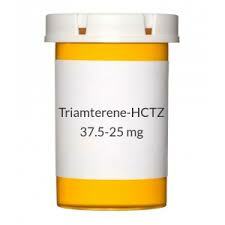 If you have any signs of allergic reaction to triamterene/ hydrochlorothiazide then go for immediate health attention. If you fell or mark any of the following side effects while taking triamterene/hydrochlorothiazide medication then immediately check with your doctor. Sometimes triamterene/hydrochlorothiazide medication may cause minor side effects in such case there is no need of medical attention because this side effect will not stay a long time as it used to your body then these side effects may disappear but if side effects continue then you need to medical attention immediately. Always take triamterene/hydrochlorothiazide medication as it was prescribed by your doctor for you. Never forget to follow all the directions on your prescription sheet. Don’t worry sometimes your doctor may change your dose for the better improvement of your health. Never use this medication in smaller or larger amounts or for the longer time than your doctor’s prescription because doing these things can be harmful to you. Always take triamterene/hydrochlorothiazide orally with or without food. If you feel any type of stomach upset then take this medication with food to reduce the irritation of your stomach. This medication can increase the amount of urine or in other word, cause you urinate more often when you take this medicine at the starting so to avoid disturbing your sleep it’s always better to take your dose before 6PM. In the case, you are using colestipol or cholestyramine then always ask your doctor how to take it with triamterene/hydrochlorothiazide medication never take it as per your own choice. If you have high blood pressure then you may feel tired for a week after starting the treatment but never stop medication even if you don’t feel better. Yes, triamterene/hydrochlorothiazide can be addictive. As per the medical report only few people who take triamterene and hydrochlorothiazide. If you mark closely almost 4,767 people who have side effects to this medication. Can triamterene/hydrochlorothiazide make you high? No, there is no such indication still found. So triamterene/hydrochlorothiazide never makes you high but never stops this medication suddenly if any problem arises or any side effects occur. Can I abrupt triamterene/hydrochlorothiazide therapy suddenly? No, normally you can’t abrupt triamterene/hydrochlorothiazide medication as per your own wish because it can be dangerous for you because if you have hypertension then abruption can cause a serious heart attack or heart failure which is always dangerous for you. Just go for medical attention and check up your body if you need abruption then you can abrupt it according to your physician instruction. Can triamterene/hydrochlorothiazide cause withdrawal effects? Yes, you may feel withdrawal effects if you are taking triamterene/hydrochlorothiazide medication. Most probably female those who are above 60 ages feel this effect. So if you are feeling withdrawal effect then immediately go for the treatment or some time you may need the dose adjustment. Never stop this medication suddenly by doing so can put bad effect on your body. Here you can find some medical conditions which may interact with triamterene/hydrochlorothiazide so in such case it’s always better to go for medical help. This is very important part to know if you are using triamterene/hydrochlorothiazide medication. Never use this medication if you have urination problem, kidney disease or high potassium level in your blood. If you are taking any herbal preparation, any prescription or non prescription medicines. If you have any allergy to any foods, medicines and other substances. If you are planning to become pregnant or you are pregnant or breast-feeding. Nonsteroidal anti-inflammatory medicines like indomethacin because these medications always decrease the effect of triamterene/hydrochlorothiazide. Angiotensin-converting enzyme inhibitors because this type of medication always increase the risk of high blood potassium and kidney problems. Anticoagulants or methenamine because triamterene/hydrochlorothiazide always decrease the effective of these two medications. If you are using any above discussed medications or if you have any health issues as mentioned above list then never take triamterene/hydrochlorothiazide as per your own choice because it can be dangerous for you so in such case, always discuss all these things and take medication according to your physician’s prescription for the best result. How long does triamterene/hydrochlorothiazide take to work? Triamterene/hydrochlorothiazide medication takes around 24 to 48 hours to work but for the full benefit of this medication you have to wait for 5 to 7 days. For better information regarding this medication and dose information better ask your physician. How long does triamterene/hydrochlorothiazide stay in your system, urine, blood, saliva? This medication can take longer to completely out from your system like if you take this medication with food or you have certain medical conditions but normally the half-life of this drug is 7 to 15 hours so for the complete clear it may take around 23 to 30 hours to be completely out from your system, blood, urine and saliva. You can use this triamterene/hydrochlorothiazide drug during pregnancy only if the benefit outweighs the risk. There is no such controlled data in case of human pregnancy. Never take this medication according to your own choice during your pregnancy because it can be dangerous for you so always follow the doctor’s instruction for the better result. There is no such clear-cut statement regarding use of triamterene/hydrochlorothiazide during breastfeeding but the decision should be made by your doctor and totally depends on your health condition. Somehow it’s risky so it’s always better to ask your doctor about this and follow his/her instruction for the best result. Can geriatric patients use triamterene/hydrochlorothiazide safely? No, geriatric patients can’t use triamterene/hydrochlorothiazide safely if they have serious health issue because older persons can easily affected by side effects. Your doctor can suggest you the best dose according to your health condition so follow their instruction for the best result. In case of triamterene/hydrochlorothiazide overdose you need call your nearest poison help center and also contact for emergency medical attention. Overdose of triamterene/hydrochlorothiazide medication is always risky and can cause serious damage to your health so never take any extra dose. You may feel various side effects on overdose of this medication like severe dizziness, nausea, weakness, fainting, fever and light-headedness. If you mark any type of side effects then immediately go for medical help. What happens if I miss the dose of triamterene/hydrochlorothiazide? Take the missed dose as soon as possible or when you remember. If it is almost the time for the next dose then just skip the dose and take care that never happen in future. Remember one thing never takes double dose or any extra dose for the drug adjustment because it can cause serious health problems to you. Can I drink alcohol while taking triamterene/hydrochlorothiazide? No, you can’t take triamterene/hydrochlorothiazide medication with alcohol because drinking alcohol can lower your blood pressure and you may mark many side effects of this medication so always try to avoid alcohol also try to avoid diet with high in salt. Always take medicines according to your prescriptions for the best result. Can patients with liver disease take triamterene/hydrochlorothiazide safely? No if you have serious liver disease then you can’t take triamterene/hydrochlorothiazide medicine safely. According to medical research if you have serious liver disease then triamterene/hydrochlorothiazide can put you on hepatic comma. So in such case the patient should take this medicine more cautiously. You need to check up your health condition regularly as if you have liver disease like jaundice then the triamterene are normally metabolized by liver so in such case your doctor may reduce the dose for effective result. Can patients with renal disease take triamterene/hydrochlorothiazide safely? No, if you have the renal disease then you can’t take triamterene/hydrochlorothiazide safely because this medication can cause serious damage to your kidney vessel. Sometime this medication is ineffective in case of renal function disorders if the glomerular filteration rate is low so thiazide diuretics therapy should be used with cautiously and some time your doctor may reduce the dose also. In the case of worst condition you have to discontinue this medication. As per the medical science, report arrhythmias are found among those people who take triamterene/hydrochlorothiazide, especially who are female and above 60 years old. So it’s unsafe for the people those who have arrhythmias problems. Triamterene/hydrochlotothiazide can cause hyperkalemia, which may result serious arrhythmias. So use this medication cautiously. Triamterene has the potassium-sparing property which always helps the hypertension patients. The frequent combination of hydrochlorothiazide and triamterene is always an effective medication for hypertension. This medication inhabitants the epithelial sodium channel in the cortical duct and triamterene just reduces the potassium secretion which always reduces the risk of hypokalemia but there is no such clear report about whether triamterene/hydrochlorothiazide has any independent effect on blood pressure or not. Triamterene/hydrochlorothiazide is always safe for heart diseases because this drug normally treats high blood pressure and high blood pressure is always the cause of several heart diseases like strokes, heart attacks so it’s definitely prevents many heart diseases. In case of serious heart problem take this medication carefully if any side effects occur then immediately goes for health checkup or medical attention. Triamterene/hydrochlorothiazide oral diuretic is good for congestive heart failure and it’s quite effective at doses of 100 mg to 200 mg per day. It also never develops drug tolerance with long-term therapy. The only triamterene is not so effective so always very effective with hydrochlorothiazide. 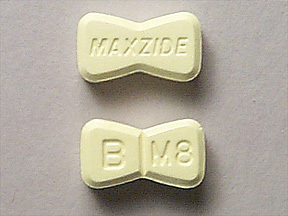 According to the medical report, hyperthyroidism is found among people those who take triamterene/hydrochlorothiazide. Most of the female who are above 60 are affected by hyperthyroidism. So if you are one of them, then use it cautiously. Triamterene/hydrochlorothiazide may decrease the protein-bound iodine levels so the physician always aware of this thing during the prescription. Yes, if you are taking triamterene/hydrochlorothiazide then you may have anxiety problem in future. As per the medical report, it is found that mostly female who are above sixty years old are affected by anxiety. So if you are taking this medication then be cautious about it because it can increase the anxiety problems. Can triamterene/hydrochlorothiazide cause low blood pressure? Yes, triamterene can cause low blood pressure and you may feel many side effects like fainting, weakness, tired. So if you mark any side effects during your triamterene medication then immediately go for medical checkup. Sometimes you may need dose adjustments or any other medications. Never take any medication according to your own choice or never stop this medication suddenly without medical attention. No, you can’t take triamterene/hydrochlorothiazide if you have diabetes problem. Triamterene/hydrochlorothiazide may raise your blood sugar so in such case you need to monitor your sugar level on regular basis so if you can’t do that then it’s too risky to use this medication. Due to problem in the rennin-angiotensin-aldosterone axis this medicine is not safe for the diabetics’ patients. If you are using then you need to monitor your blood sugar level and serum potassium level and renal function regularly for safety. Acidosis normally alters the extracellular potassium and may lead rapid increase in serum potassium level and it can increase the effect of acidosis. Because of the hyperkalemic effects triamterene/hydrochlorothiazide should be avoided in patients. If you have serious problem then you need to check up your serum potassium and acid-base balance on regular intervals for the best dose of the medication. This is not safe to use triamterene/hydrochlorothiazide for hyperkalemia because this medication contraindicated the potassium serum concentration which can cause serious hyperkalemia problems as a result cardiac arrhythmias so in such situation, at the initial stage of therapy you need to check up your serum potassium on regular intervals and you may also need dose adjustment so do worry take medication according to your prescription. According to medical research, asthma is found on people those who are using triamterene/hydrochlorothiazide medication and this is normally found on female those who are above 60 years of old and have been taking this medication for one to six months. So if you have asthma problem then use it cautiously because it can increases the asthma effect. Triamterene/hydrochlorothiazide may enhance the cholesterol and triglyceride levels. Still there is no confirmations about these effects are for dose related or not. If you have pre hyperlipidema then you need to do regular monitoring of your health condition during this therapy some time you have to adjust the dose according to the lipid-lowering regimen which is always important. Can I take triamterene/hydrochlorothiazide and aspirin together? As per the medical report till now there are no such interactions found between triamterene/hydrochlorothiazide and aspirin medications together but that doesn’t mean that there is no interactions exist so never take any medicines without the prescription. If you mark any side effects then go for a medical checkup because sometimes you may need dose adjustment for better improvement of your health condition. Can I take triamterene/hydrochlorothiazide and metoprolol together? According to the medical report triamterene/hydrochlorothiazide is not safe at all with metoprolol because this combination may lower your heart rate which can cause dizziness, weakness and other problems to you. It also can be the cause of irregular heartbeat, fainting and loss of blood glucose control. If you are using this medication then you need to checkup your blood pressure on regular basis. Can I take triamterene/hydrochlorothiazide and esomeprazole together? As per the medical science using esomeprazole with triamterene/hydrochlorothiazide can cause low blood magnesium which is also known as hypomagnesemia and if you will use it for long period of time then it can cause other problems like muscle spasm, heart rhythm, tremor and palpitations. In case of children it can cause abnormal heart beat, upset stomach, fatigue and dizziness so for this you need to check up your body on regular interval and should take medicine as per the prescription of your physician. Can I take triamterene/hydrochlorothiazide and duloxetine together? According to medical test duloxetine with triamterene/hydrochlorothiazide medication can cause low blood sodium level which is also known as hyponatremia condition. In such case you may mark various side effects like muscle spasm, nausea, weakness, irritability, memory impairment, confusion and in case of severe condition the patient may go to coma or fainting condition. So use this medicine cautiously and always check up your body and take medicine according to your prescription some time you may need dose adjustment also. Can I take triamterene/hydrochlorothiazide and viagra together? No, you can’t take triamterene/hydrochlorothiazide and viagra together. According to report there are drug interactions found between triamterene/hydrochlorothiazide and Viagra medication so never take these two medicines together. Can I take triamterene/hydrochlorothiazide and metformin together? No, you can’t take triamterene/hydrochlorothiazide and metformin together because according to the medical report drug interactions are reported people those who take metformin and triamterene/hydrochlorothiazide together. A doctor can only suggest you best medication according to your present health condition so never take medication according to your own choice because it can be dangerous for your health. Can I take triamterene/hydrochlorothiazide and hydralazine together? According to medical data base and research hydralazine and triamterene/hydrochlorothiazide medication together can cause serious interactions which can very dangerous for your health. So the answer is no, you can’t take it safely together without a prescription. Can I take triamterene/hydrochlorothiazide and amlodipine together? No, you can’t take triamterene/hydrochlorothiazide and amlodipine together because as per the medical research interactions found between these two medications so you should use it cautiously. Can I take triamterene/hydrochlorothiazide and advil together? No, you can’t take advil and triamterene/hydrochlorothiazide together without the instruction of your doctor. According to the research, these two medications can cause serious interaction so always harmful for human body. It’s always quite necessary to keep this medicine at a room temperature between 68 and 77 degrees F and avoid excess temperature, heat and moisture. Brief storage is permitted at temperature between 59 to 86 degrees F. Never keep this medication in your bathroom and always keep out of the reach of pets and children. To know the proper way of disposal you should ask your physician.